Put the honey, mirin, soy sauce, diced chilli and grated ginger and oil to a bowl and mix together. Add in the chicken wings and mix them thoroughly until all of the wings are coated with the sticky glazed mixture. If time allows leave the wings to marinade overnight but if not a couple of hours will suffice. Arrange the chicken wings on a roasting tray and keep some of the marinate on the side. Bake for 30-35 minutes until the wings are almost fully cooked. Meanwhile heat the reserved marinade in a small saucepan and bring to a rapid boil for a moment or two -be careful with it at this stage as the honey may have a tendency to burn. Sometimes if I feel it is reducing too quickly I will add one or two tablespoons of boiled water just to add an extra liquid content to the marinade. After the marinade has come to the boil pour it over the chicken wings as they have come out of the oven and mix the wings to make sure they, again, are all coated with the marinade. 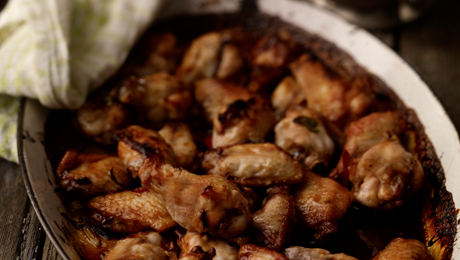 Increase the heat of the oven to 200C/400F/Gas Mark 6 and return the chicken wings with the marinade to the oven. Allow them to cook for an additional 15-20 minutes at this stage. Take them out of the oven every so often and give them a little shake to prevent them for sticking to the tin but also to ensure that each of the wings are covered with the sticky glaze. You can replace the mirin by dry vermouth or sherry!